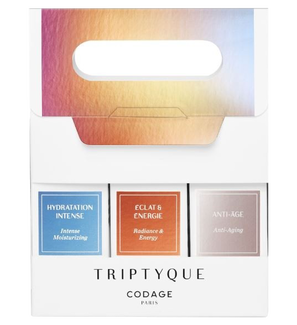 CODAGE is revolutionizing the world of beauty by creating TRIPTYQUE, a set of travel-sized serums that adapts itself to the needs of each skin. The ESSENTIAL TRIPTYQUE is composed with the 3 bestsellers of the CODAGE Face Serums collection available in 10ml, a quantity that represents at least 1 month of use per product for a twice daily application, morning and night.This set of serums brings hydration and radiance to the skin while smoothing wrinkles.All CODAGE serums can be combined and mixed together (mixing, zoning and/or layering) according to the "Mix & Match" concept, to respond to your skin’s primary and occasional needs related to the constant changes of modern life. Change serums every day, according to your needs, or mix them together for 100% adapted skincare and rejuvenated and luminous skin!